A review of “The Inconvenient Indian – A Curious Account of Native People in North America” by Thomas King, published by Anchor Canada, a division of Random House, 2013, 314 pages. Thomas King, best known as the creator and star of the hilarious CBC Radio One series “The Dead Dog Cafe Comedy Hour”, is the author of a funny book about the sad tragedy that is the situation of North American indigenous peoples. The book is a best-seller, proving again that a serious message can reach a huge readership through the medium of satire, without debasing the cause. 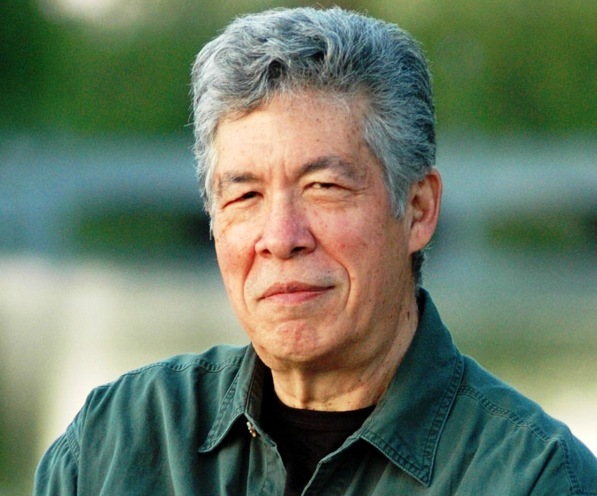 Born in Sacramento, California, Thomas King is of Cherokee, Greek and German-American descent. As an adult, he migrated to Australia, where he worked for years as a photojournalist. After moving to Canada in 1980, King taught Native Studies at the University of Lethbridge in the early 1980s. He also served as a faculty member of the University of Minnesota’s American Indian Studies Department. King is currently an English professor at the University of Guelph, about an hour west of Toronto. King was the NDP candidate for Guelph in the October 14, 2008 federal election, finishing fourth behind the Liberal, Conservative, and Green Party candidates. 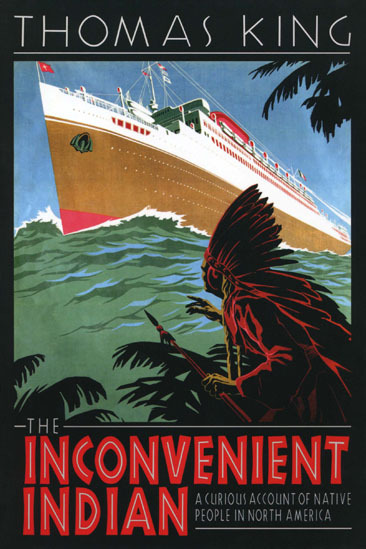 “The Inconvenient Indian” is a short, post-modern version of “Bury My Heart at Wounded Knee.” King recounts the massacres inflicted by the European colonial powers, records many of the lies, broken land treaties, the physical displacement, and the cultural genocide that still masquerades as education. The author postures as the skeptic, and proceeds to eviscerate the skepticism that surrounds corporate media coverage of aboriginal issues. King identifies three kinds of Indian: Dead Indians, Live Indians and Legal Indians. Dead are the ones that “are the stereotypes and cliches that North America has conjured up out of experience and out of its collective imaginings and fears.” Society sees “war bonnets, beaded shirts, fringed deerskin dresses, headbands.” “You can find Dead Indians everywhere. Rodeos, powwows, movies, television commercials.” They pose no threat to power. The Canadian census of 2006 records the existence of 565,000 Status Indians. The total indigenous population in Canada then, including Indians, Metis and Inuit, was 1.2 million – not counting those living on at least 22 Indian reserves, overlooked according to Statistics Canada. In the United States, federal “recognition” is granted to tribes rather than individuals. In 2009 the U.S. Federal Register recognized 564 tribes, encompassing about 950,000 people. The total number of Indians in the U.S. is around 2.4 million, or a few hundred thousand more or less, given the vagaries of the census. Legal Indians have certain rights and privileges – because of the treaties both countries signed with Native nations. About 40 per cent of Live Indians in North America are Legal Indians. King caustically observes that “while North America loves the Dead Indian and ignores the Live Indian, North America hates the Legal Indian. Savagely.” He acerbically describes the treaties as an error in judgement that the establishment has been trying to correct for the last 150 years. Well, should Jews, gays and Roma people just ‘get over’ the Nazi holocaust? Ought Blacks just ‘get over’ the murderous Middle Passage and nearly three hundred years of slavery? Doesn’t the commitment to the idea of ‘Never again’ require an historical memory? How about the question of Aboriginal self-reliance? King writes: “I’ve been told any number of times that we have to learn to stand on our own two feet and develop the skills necessary to manage on our own, without relying on government generosities. “In the same way that Air Canada, AIG, Bombardier, Halliburton, General Motors, and the good folks out in Alberta’s Tar Sand Project manage on their own, without relying on government handouts. “I suppose I could have mentioned Enron, World Com, Bre-X, and Bear Stearns as well, but these disasters were more greed than incompetence. Weren’t they? Though I suppose the one does not preclude the other. That’s a surprisingly radical analysis for a one-time NDP candidate, even if it is not accompanied by a concrete programme for radical change. Here’s another way to look at the self-reliance idea, as it’s posed under capitalism. Some workers belong to a union. That gives them strength lacked by workers who don’t. Some indigenous people have treaty rights, which gives them a toe-hold, and a bit of leverage on the capitalist state. In the absence of a cooperative commonwealth for all, does it make sense to give up the little they’ve got, however ‘inconvenient’ they may be to big business? To be sure, “The issue has always been land” insists King. “It will always be land, until there isn’t a square foot of land left in North America that is controlled by Native people.” It’s a sensitive issue, as discovered by 13-year-old Tenelle Starr from the Star Blanket First Nation, 90 kilometres north-east of Regina, Saskatchewan. 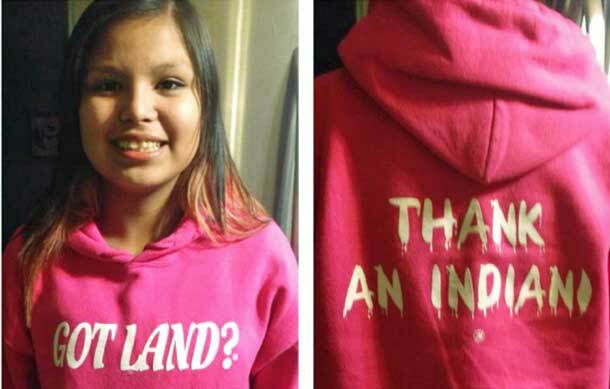 She was sent home from school in early January because she was wearing a pink hoodie bearing the slogan ‘Got Land? Thank an Indian’. The good news is that now Tenelle’s friends are sporting the slogan, and the social media is all a-buzz. In the meantime, indigenous land titles continue to stand in the way of corporate resource extraction, even of military training bases (like the one at Stoney Point Ojibway reserve in Ontario where provincial police shot and killed native protester Dudley George in 1995). 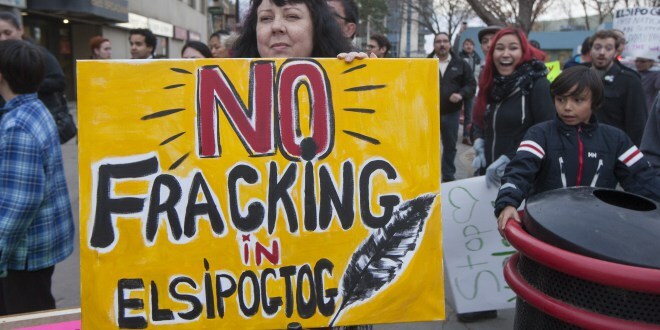 Fortunately, indigenous peoples’ opposition to pipeline construction has helped to forge an alliance of farmers, workers and environmentalists concerned about pollution and climate change. 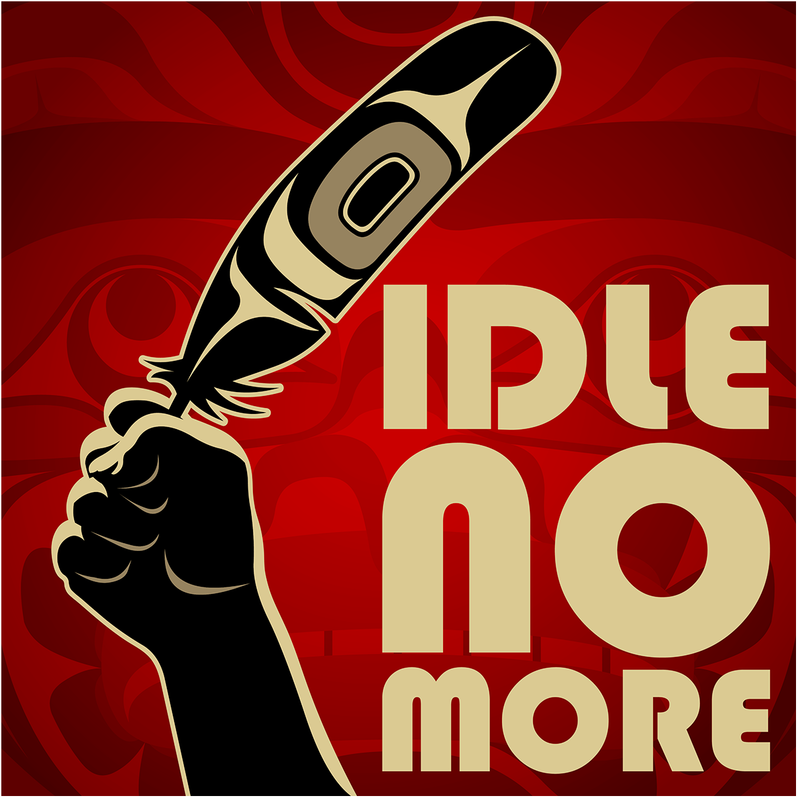 This convergence is reflected in the broad public support for the Idle No More movement that arose in late 2012. The path that capitalists and their governments have taken to remove the native land obstacle to profit maximization is called ‘termination’. If the policy sounds deadly, it’s no accident. In 1953, the U.S. Congress passed the Termination Act and the Relocation Act concurrently. It allowed Congress to terminate all federal relations with tribes unilaterally, while Relocation “encouraged” Native people to quit their reservations and move to the cities. In 1969, the Canadian government tried to do the same thing with its White Paper. Then-Prime Minister Pierre Trudeau suggested that there is no such thing as Indian entitlement to land or Native rights, and urged First Nations people to assimilate into Canadian society. The reaction was massively and fiercely negative. 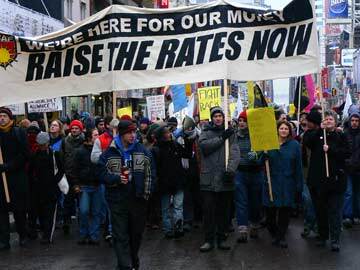 What do you suppose would happen if Liberal Leader Justin Trudeau advocated that today? While the Conservative government of Stephen Harper drags its feet, Tory ideologue Tom Flanagan openly campaigns for the termination of Native status, and for dispersal and privatization of aboriginal lands. The interest of the working class lies in solidarity with Indigenous peoples. The reasons are clear. One is the practical need for unity between workers and all oppressed peoples against the bosses and their state. Another is based on recognition that the struggle of Indigenous people to preserve their collective land rights constitutes a powerful obstacle to the agenda of Capital – which is to turn all of nature into a commodity, for sale to the highest bidder, subject to ruthless despoliation. Thomas King’s “The Inconvenient Indian – A Curious Account of Native People in North America” is remarkably witty, often hilarious, and a truthful companion for the important battles ahead. Read it, and use it well. In a shameful move, the labour-based New Democratic Party in New Brunswick republished an aggressively titled op-ed article on its website, “Don’t Negotiate Till Threats End!”. The article was taken down and replaced by similarly problematic editorial, “Reality Check: The Law is the Law” written by the party leader in the province, Dominic Cardy. But in the next paragraph, he puts on his policeman’s hat and gives the reader a stern tautological legal lesson, “Any blockade… must end… because the law is the law. [Activists] have an equal responsibility to stand up against law breaking and vandalism”. He didn’t mention whether he had a plan to crack down on the menace of littering or jay-walking. Cardy attempts to resolve the cognitive dissonance of respecting the ‘rule of law that can’t be trusted’ by revealing his actual plan to stop shale gas: an NDP government led by him. The environment is to be saved by electing him as premier, or not at all. Aside from opposing shale gas though, it is difficult to see how the party under his leadership would substantially differ from the current regime. Cardy is a proponent of the right wing “Third Way” movement within the Socialist International. He took the lead in pushing for a lesser role for labour in the federal party, and looks up to imperialist war criminal Tony Blair. This ahistorical diatribe is especially disappointing, coming from an NDP leader because it betrays the party’s own history. Participants in the 1919 Winnipeg General Strike, which brought the city to a grinding halt, likely wouldn’t have cared much for Cardy’s “the law is the law” attitude when they were savagely attacked by the police and thrown in prison. One of those participants, J.S. Woodsworth, later went on to become the first leader of the Co-operative Commonwealth Federation, predecessor of the modern day NDP. This identity crisis is not new for the party, but it is accelerating at an alarming rate. As capitalism descends deeper into crisis, it’s contradictions, which are fundamental features of it’s political reality, are highlighted by statements such as this. At a time when workers and the growing underclass are losing more and more at the expense of big business, the platform and actions of the labour bureaucrats and ruling class politicians who purport to represent the workers’ interests are getting more and more watered down and lacklustre. Ultimately, it is not solely the fault of these social democrats that the party agenda is more and more accommodating to the status quo. The demands of workers can be advanced only when workers themselves raise them. In building unions, activists have created institutions capable of fighting for their interests, but the task of leading that fight can not be successfully delegated. Left to its own devices, the labour bureaucracy develops petty interests of its own, putting their jobs and privileges above all else. The NDP can be a vehicle for change and a voice for radical populist movements like Idle No More and the campaign against environmental degradation — but not by trusting politicians to take care of business. 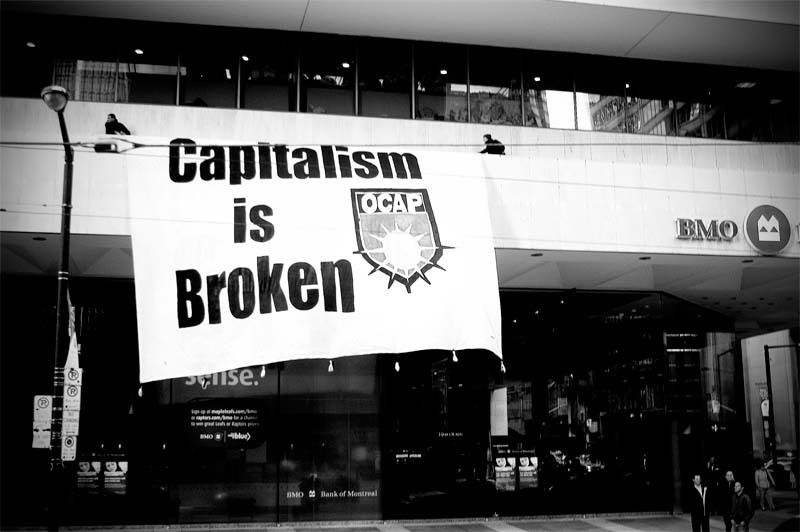 The task of achieving basic change can be fulfilled only by applying continuous pressure from the bottom up — by the people whose lives are directly affected by the plunder of global capital. We need a radical labour movement driven by, and for workers! To move forward, are obliged to struggle against the alienating effects of bureaucracy, especially in the NDP and the labour movement. 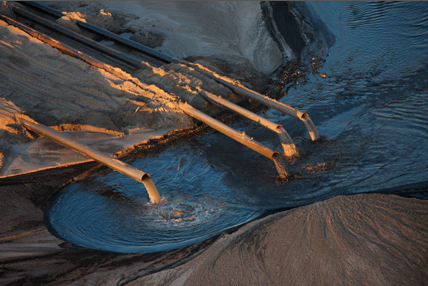 Less than 1 per cent of the environmental violations arising out of Alberta’s tar sands have been penalized. So says a survey by Kevin Timoney, a biologist and environmental consultant, and Peter Lee of Global Forest Watch. The authors of the 677-page report found the same problems recurring again and again, suggesting that the province’s claims to having strict control over the industry’s environmental impact are false. “What we’re seeing is the tip of the iceberg”, said Timoney, who filed a massive number of Freedom of Information applications, starting in 2008, in order to see details of breaches of environmental regulations and conditions that were kept under wraps in Alberta Environment’s data library in Edmonton. Timoney and Lee eventually compiled a list of 9,262 infractions since 1996 – ranging from spills into the Athabasca River, to excessive smokestack emissions, to the discovery of random waste dumps in the bush. Nearly two-thirds of the violations were of air quality, usually involving emissions of gases like suphur dioxide and hydrogen sulphide in excess of the hourly limits on the tar sands facilities. Of the total number of incidents, about 4,000 were reported as “alleged contraventions” – a breach in a facility’s license conditions. Since 1996, the Alberta government took action in 37 of those cases for an enforcement rate of 0.9 per cent. The median fine was $4,500. Call it a minor cost of doing this dirty, but highly profitable business. In July, old news became new again. The commercial media published stories about medical and nutrition experiments conducted in Canada’s Indian Residential Schools during the 1940’s and 1950’s. Why call it ‘old’ news? Because an article on this topic appeared in the Vancouver Sun in 2000 (http://canadiangenocide.nativeweb.org/keynewsnativekidsusedforexperiments.html). In fact, along with the research that Dr. Peter Bryce, Chief Medical Officer of Canada, conducted in the early 1900’s about the condition of children in the ‘schools’, as directed by Duncan Campbell Scott, Canada’s Superintendant of Indian and Affairs, these results were printed in The Ottawa Citizen in November 1907, (http://canadiangenocide.nativeweb.org/keynewsschoolsandwhiteplague.html) only to be promptly buried and forgotten, causing hardly a ripple. It seems that the only person who took much notice of Dr. Bryce’s research, that the death rates in the Western ‘schools’ ran between 30 and 60 per cent, was D.C. Scott himself, and he was not pleased. By 1913, Dr. Bryce’s services were no longer required. Information about these experiments was also reported in a 2006 documentary on Canada’s Indian Residential Schools titled “Unrepentant: Kevin Annett and Canada’s Genocide”. The United Church de-frocked minister Annett when he blew the whistle on Church abuses of survivors and victims of British Columbia’s Indian Residential Schools on Vancouver Island, and illegal land sales conducted by that church to a logging company. This ‘old-new’ story was contained in the report published by one Ian Mosby, a post-doctorate fellow of Guelph University in Ontario, written in his capacity as a food historian. It provided information about the treatment of the health of Native populations, and of Indigenous children in Residential Schools across the country. Mosby found it in an article he came across in May 2000, in the Anglican Journal — the same piece found by the Vancouver Sun, and by Kevin Annett, back in 2000. Digging deeper, Mosby found government documents that revealed an experiment conducted on some 1,300 indigenous people, most of whom were children, beginning in northern Manitoba in 1942, and eventually spanning the country through the early 1950’s. The experiments targetted First Nations people, it seems, because rampant malnourishment prevailed in most of their isolated and poverty ravaged communities. Indigenous peoples were forced to live on ‘Reserve land’ and be ‘assimilated’, ‘civilized’ and ‘educated’ within the confines of church and state policy. After the collapse of the fur trade, they proved to be ‘ideal’ test subjects for different diet regimens. Some children were given vitamin enriched diets. Others were denied vitamins. Still others were limited in their intake of milk rations. In terms of milk consumption, doctors knew that tuberculosis could be contracted through non-pasteurized milk, but many schools still served it to children. The medical experimentation consisted of depriving children of dental care, since the health of one’s gums is a health indicator, and the treatment of gum disease could have skewed experiment results. Ironically, an “Indian person” could not refuse medical treatment, according to Canada’s Indian Act. The response of some prominent Canadians and Native people to this ‘news’ is shock and surprise. The Assembly of First Nations Chief Shawn Atleo expressed awareness of the situation: his father had gone to the school in Port Alberni, B.C. But he said he did not realize that a government experiment had taken place. The Aboriginal Affairs critic for the Official Opposition New Democratic Party, Jean Crowder, spoke about the life of poverty that still dominates First Nations’ communities, and how poor nutrition remains an issue. I was dismayed, but not surprised by Justice Murray Sinclair, Chair of Canada’s Truth and Reconciliation Commission (TRC) into Indian Residential Schools. On his Facebook page, Sinclair expressed shock and surprise. However, subsequent media coverage reported that he was not surprised by the news of the experiments because of revelations at the TRC Hearings, now in the final year of its five year mandate to collect data and listen to survivors. Murray Sinclair has disappointed me on other occasions, including when, during an interview with CBC’s news anchor Peter Mansbridge, Sinclair stated he was most surprised that children actually died in these ‘schools’. On another occasion, Sinclair had the audacity to apologize publicly to the Catholic Church on behalf of the TRC, and on behalf of his head researcher, John Milloy, (who was also a researcher on the 1996 Royal Commission on Aboriginal Peoples), for pushing the Catholic Church too hard to fully open ALL of their archived documents … which they refused to do … and still refuse to do. John Milloy also apologized to the church. He subsequently resigned from the TRC. By the way, the Canadian Government is also withholding archival materials, and has acknowledged that it destroyed documents on at least three occasions, allegedly to make space for more important stuff. Canada’s current Aboriginal and Northern Affairs Minister, Bernard Valcourt wonders aloud whether this story is true — but if it is, it is “abhorrent and completely unacceptable”. In a July 17, 2013 article in The Globe and Mail, Shawn Atleo states: “We’re going to call on the Prime Minister to give effect to the words that he spoke when he said: ‘The burden of this experience has been on your shoulders for far too long. The burden is properly ours as a government.’” This refers to Prime Minister Stephen Harper’s 2008 official apology for residential schools. On July 25, after a call-out for action went viral, protests took place across the country on the theme “Honour the Apology”. We’ll see where this ‘old – new’ story takes us. Harper’s Conservative government pledges to follow a court order to hand over ‘relevant’ documents to the TRC. But who knows when that will happen? 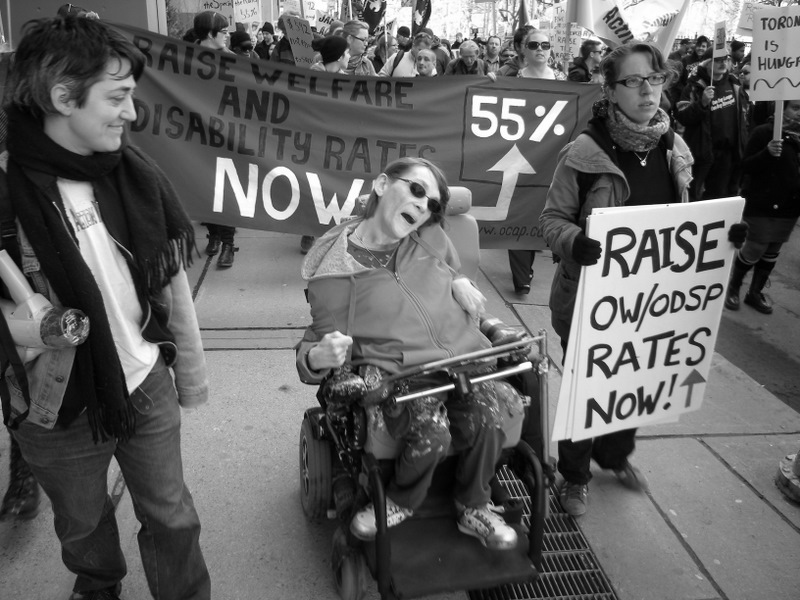 Carrie Lester is a Native rights, environmental activist of mixed Mohawk / Bearfoot Onondaga / UK-Canadian-settler heritage, and is a member of the Canadian Union of Public Employees, based in Toronto.